This document will explain all the steps required to add document links in your WEBI form. Open the WEBI form in BI launch Pad only in view mode. 2. Go to Report Elements tab and select blank cell and drag it into the form. 3. Type some text in the blank cell. 4. Right Click on the cell and then go to Linking. 5. Select the option Add Document Link. 6. 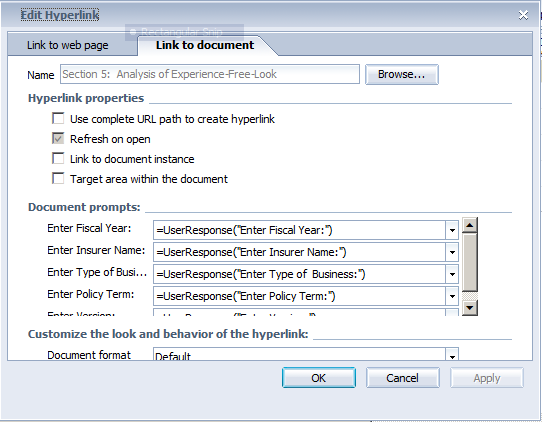 In the Edit Hyperlink prompt window, Browse and select the document for which you want to give the hyperlink. 7. You can edit Hyperlink Properties or Document Prompts as per your requirement. 8. In the Document format, select the desired format for your document. 9. Click Apply and then OK.
10. Click on the link and the desired document will open in the new tab.